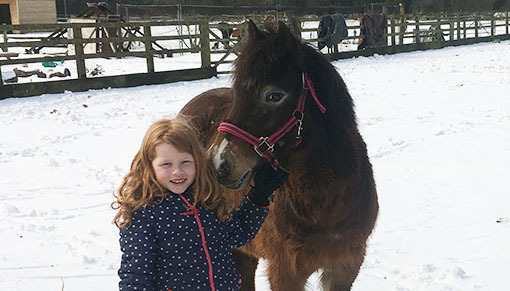 Native pony Ruby was rehomed in June 2017 and in her first year with her new Guardian family she has proven to be living up to her gemstone name! Ruby, now 11, came to Redwings in 2009 as one of group of 35 horses and ponies rescued from a stretch of riverbank at a site in Norfolk. When the RSPCA were called to investigate this group of equines sadly one was so severely emaciated that it had to be put to sleep to prevent it suffering further. The RSPCA then asked for the expertise of a Redwings vet to further examine the group, who were all found to be in varying body conditions, with many emaciated and others likely to suffer as a result of their lack of food and grazing. The ponies also had very matted manes and tails and were infested with lice, living amongst broken machinery that posed a hazard to their safety. Sadly, no owner could be traced for the 35 ponies so they were offered a safe home at Redwings and all named after gemstones, precious metals and minerals. Ruby only had a Body Condition Score (BCS) of one when she was rescued, meaning she was underweight and well below the ideal BCS of three. However, despite being rescued from such terrible conditions, thanks to the loving care she received from the Redwings veterinary and care teams, she made a full recovery and her sweet nature was allowed to flourish. 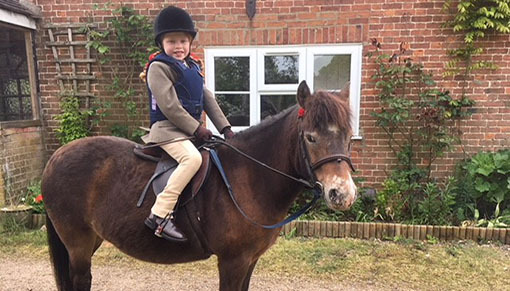 She was soon identified as a suitable candidate for our rehoming scheme as a child’s ridden pony, and in 2017 she moved to her new home with Guardian family the Gents and her young rider Suzanna. Suzanna’s mum, Saskia, said: “Suzanna and Ruby have become a well-matched team. They enjoy competing at local shows and taking part in Pony Club rallies. Like many ponies Ruby does have a cheeky side, especially when it comes to trying to sneak a snack of grass when out hacking and going out of her way to avoid stepping in puddles! But, she has such a gentle, calm nature and absolutely loves being around children. We love it in the winter when she grows her thick winter coat and becomes even more soft and cuddlesome! To find out more about our rehoming scheme, and to see the other gorgeous horses and ponies waiting to find their loving Guardian homes, please click here.